For those who would rather do that which is right than wrong it is a joy for the just to do judgment. (Proverbs 21:15). It is joy to the just to do judgment: but destruction shall be to the workers of iniquity. The habitation of the throne of God is one of justice and judgment, and His people are blessed for walking in His ways! (Psalm 89:13-17). Thou hast a mighty arm: strong is thy hand, and high is thy right hand. Justice and judgment are the habitation of thy throne: mercy and truth shall go before thy face. Blessed is the people that know the joyful sound: they shall walk, O Lord, in the light of thy countenance. In thy name shall they rejoice all the day: and in thy righteousness shall they be exalted. For thou art the glory of their strength: and in thy favour our horn shall be exalted. There is a great twisting of justice found in this world, and scripture teaches there are some who justify what is wicked and therefore taking away righteousness from the just and righteous ones. 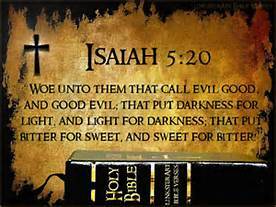 (Isaiah 5:20-23). Woe unto them that call evil good, and good evil; that put darkness for light, and light for darkness; that put bitter for sweet, and sweet for bitter! Woe unto them that are wise in their own eyes, and prudent in their own sight! Woe unto them that are mighty to drink wine, and men of strength to mingle strong drink: Which justify the wicked for reward, and take away the righteousness of the righteous from him!